Bacon does make everything tastes better. It was the meaty smoky brininess of the real porky kind that got us hooked after the first forkful of Carbonara Dcova (RM20.90+). Lightly tossed in lush white sauce and surrounded by juicy strips of cooked bacon, this house pasta proves to be a real gem of a find on our maiden visit to DCOVA. Owned and run by a bunch of passionate foodie friends including former Foodsion editor Oo Lean Hooi, DCOVA is a cosy, rustic nook where freshly brewed coffee and premium quality tea infusions rule the roost. An all day dining menu tickles the tastebuds with excellent a la minute pasta dishes and artisanal dessert. Coffee enthusiasts will find DCOVA serves the requisite java brews expected of it. Since we prefer a milder coffee based drink, the signature Freddo (RM13.25+) imparts well-balanced astringency and a nice creamy finish. Fine tea infusions by the exclusive Tea Leaves from Singapore (they also supply to the posh Four Seasons hotel group) are given equal importance here. At Lean Hooi's recommendation, we complement our meal with Shanghai Rose (RM17.80+), a splendid black tea with smoky sweet rose notes. Sliced lemon is served on the side should you wish to infuse the tea with refreshing citrusy tang. Herbal and citrus nuances are discernible upon us sampling the Lemon Verbena infusion. This beverage goes well with the heavier pasta dishes; perfect as a palate-cleanser. Not into caffeinated drinks? Then Summer Strawberry (RM14.30+), a berry refreshing thirst-quencher is your drink of choice. Health buffs and light eaters will find Teriyaki Chicken Salad (RM18.90+), a mound of fresh salad leaves, rocket and cucumber slices with cherry tomato halves dressed in nutty goma (sesame seed) sauce a godsend. We like how the sweetish bite-size chunks of teriyaki chicken and crunchy walnuts pile on flavourful and textural dimension to the ensemble. Springy fresh prawns from Taiping and succulent squid give the resto’s Spicy Seafood Aglio Olio (RM23.90+) its winsome edge. Tossed with garlic and extra virgin olive oil, the perfectly al dente pasta is spiked with chopped bird's eye chilli, setting the tastebuds ablaze with sporadic bursts of hotness. More prawns, crunchy ebiko (prawn roe) and momi nori (crumbled seaweed) bestow delicate layers of flavours and textural mouthfeel to Ebiko Alfredo (RM23.90+), lifting this creamy, savoury pasta offering to raveworthy new heights. Squid ink powder plays a central role in the speciality of Riz Alnero di Seppia (RM28.90+), rendering the fragrant rice grains ebony black. A pair of fried prawns and tender squid rings inject oceanic sweetness into the mound of blackened rice. The condiment is also used in the making of Pasta Alnero di Seppia (RM27.90+). Although the pastaregales the tastebdus sufficiently with the clear umami flavour of ebiko, this dish somehow fails to elicit the same ardour we had for the rice dish. Make sure you leave enough tummy space for the luscious dessert at DCOVA. Supplied by Passionis – Penang's patisserie par excellence, the Japanese-style Strawberry Shortcake is on-point and resembles what I had savoured in the Land of the Rising Sun. Sandwiched in-between layers of airy-light cream and fresh strawberry bits, the delicate cotton-soft vanilla sponge is a beguilingly ethereal treat too good to share. Mirror-smooth, glossy ganache crowned with a single, whole hazelnut gives the best clue to just how exquisite the Double Chocolate Hazelnut Praline tastes. Avid chocoholics will be thoroughly smitten by the sublime, multiple layers of dark and milk chocolate, chocolate mousse, chocolate sponge and a crispy feuilletine layer at the bottom. I was. For reservations, call DCOVA, tel: 04-261 3121. Address: Logan Heritage No. 4, Lebuh Bishop, George Town, Penang. Mention loong da’an (龙旦) in Cantonese – giant grouper/garoupa to Chinese food connoisseurs and you’d see the respect this regal deep-sea denizen commands. A huge fish that can grow up to 9 feet long, this fish is a rarity so if you’re partial to loong da’an, head to any of the Oriental Group of restaurants to savour this prized catch this June. 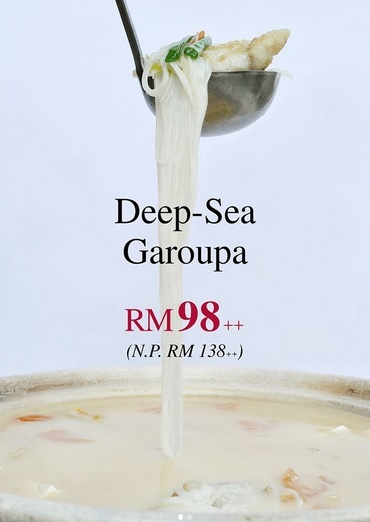 Instead of the normal price of RM138++ per portion, the Deep-Sea Garoupa is priced at RM98++ per portion only, available now until end June 2017. You can enjoy it prepared four ways which emphasise the fabulous eating quality of this fish. Known for its sweet, meaty white flesh and slightly chewy, gelatinous skin, the garoupa Braised Traditional Style is served sizzling hot in a claypot. Enrobed in a sheer glossy sheen of delicious, sticky sauce, every chunks of the smooth meat yields saucy savouriness that enhances the fish’s natural sweetness. Complementing the tender garoupa are plump, succulent black mushrooms along with soft dau karn (compressed beansheets), crunchy waterchestnuts and slightly caramelised garlic pips. Excellent lip-smacking stuff. Deep-Sea Garoupa prepared Aberdeen Sizzling Shunde Style may look similar to the former but the distinct difference is telling once whiffs of the aromatics used for this speciality reach your nose. The heat not only amplifies the fragrant coriander stalks, whole shallots, sliced ginger and red chilli in the claypot but also infuses the generous garoupa pieces with the aromatics’ big, appetite-whetting flavours. A step up from the regular yue thau mai (fish head noodles), the posher Deep-Sea Garoupa with Rice Vermicelli in Superior Stock is a humble treat that’s fit for a king. Pin-drop silence around the table is not uncommon when everyone focuses on slurping up the milky, fish-sweet broth with delectable mee hoon (rice vermicelli) punctuated by the occasional strands of sourish hum choi (salted mustard green), diced tomato dices and smooth beancurd. Some greens won't go remiss especially when it's blanched leafy greens smothered in rich, eggy sauce. Think of it as a healthier, carb-free kong fu chau (Cantonese fried noodles). Alternatively, you may like to try the fourth option of Deep-Sea Garoupa Steamed with Fresh Beancurd Skin & Black Fungus. 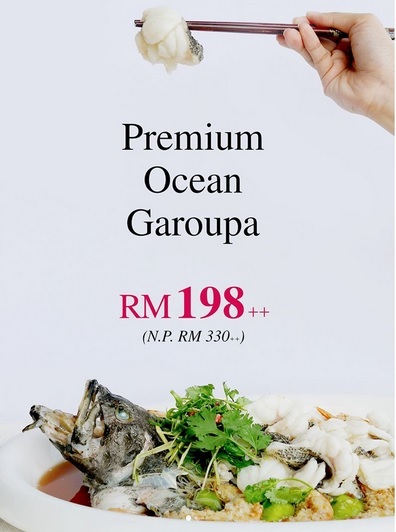 For diners who prefer partaking whole fish, Ocean Garoupa is available at the promotional price of RM198++ each (normal RM330++ each). Weighing about 800g-1kg per fish, one of the recommended preparations is to relish it Steamed with King Prawns, Glass Noodles & Garlic. The doneness is spot-on, rendering the Ocean Garoupa seductively flaky-soft and sweet on our palate. Coupled with springy garlic-flecked prawns, the slippery strands of glass noodles steeped in the yummy fish-prawn jus make the overall dish a scrumptious gastronomic delight. Personally I’d vouch for the Ocean Garoupa Boiled with Fish Maw, Yam & Chinese Cabbage in Superior Fish Stock any day. Friends who know me would be shocked as I’m averse to soupy fare but the masterful textural combination of powdery yam with spongy fish maw and soft, wilted cabbage had me at hook, line and sinker. A sophisticated speciality that tastes so homespun, what’s not to like? Prefer the bare-frills approach? No problem, you can order the garoupa Steamed with Chef’s Special Preserved Radish too. The Deep-Sea Garoupa and Ocean Garoupa promotion are available at all Oriental Group restaurant.